Day Tours | The Taxi Co.
Why not book one of our Taxi Co. Day tours, taking you to key locations around the North West. Why not get the most from your stay in the North West. Take a Taxi Co. Day tour and broaden your experience. With great value trips to key tourist attractions why not spend a day at the Old Bushmills Distillery, the World Famous Giants Causeway or Doagh Famine Village. Quotations for 5,6,7 & 8 Persons on request. Pick-ups from your hotel, guesthouse or home can be arranged. Take the exhilarating rope bridge to Carrick-a-Rede island and enjoy a truly cliff top experience. 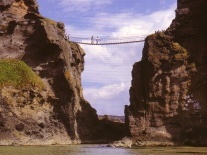 This 30-metre deep and 20-metre wide chasm is traversed by a rope bridge traditionally erected by salmon fishermen. Visitors bold enough to cross to the rocky island are rewarded with fantastic views. A short coastal footpath leads to Carrick-a-Rede Rope Bridge. On the way, there are wonderful vantage points to stop and take in the natural beauty. 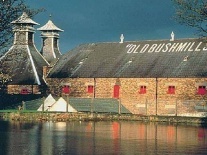 Bushmills Irish Whiskey is made at Ireland’s oldest working Distillery in County Antrim, Northern Ireland. The brand portfolio includes five award winning whiskeys: Bushmills, Black Bush, Bushmills 10 year Malt, 16 year Malt and 21 year Malt. Bushmills is the only distillery in Ireland to make triple-distilled malt whiskey. Watch Whiskey making take place and enjoy a wee taster too as we unlock the secrets of 400 years of distilling at the home of Irish whiskey. 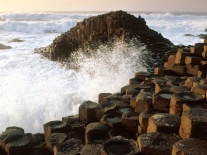 Northern Ireland’s iconic World Heritage Site and Area of Outstanding Natural Beauty, the majestic cliffs of the causeway and inaccessible bays combine with myth and legend. Explore the basalt stone columns left by volcanic eruptions 60 million years ago and search for distinctive stone formations fancifully named the Camel, Wishing Chair, Harp and Organs. Dotted around the coast you’ll find small sheltered harbours and slipways, fishermen’s cottages and rock formations that you will never forget. Visit the stunning landscape of Downhill Demesene, with its beautiful gardens and magnificent clifftop walks, affording rugged headland views across an awe-inspiring north coast. Discover the striking 18th century mansion of the eccentric Earl Bishop that now lies in ruin and enjoy a stroll around the inspiring gardens. 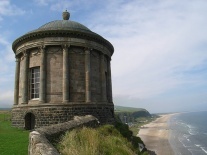 Explore Mussenden Temple, perched on the cliff edge and take in the panoramic views. 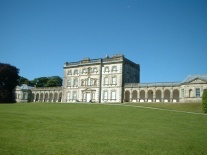 If you are looking for stately grandeur then Castle Coole is a rare treat. Surrounded by its stunning landscape park on the edge of Enniskillen, this majestic 18th century home of the Earl of Belmore, designed by James Wyatt, was created to impress. The surrounding wooded landscape park sloping down to Lough Coole is ideal for long walks. Take in it’s exquisitely awe-inspiring beauty with rich decoration, furnishings and furniture. 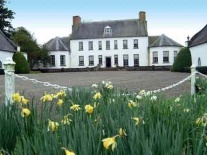 There is something for all the family at this 18th Century property, the former home of the Earls of Enniskillen. The house enjoys a peaceful setting in West Fermanagh, with a dramatic backdrop of mountains and forests. There are glorious walks to enjoy, as well as fine vistas and play areas. There is even a charming walled garden. Outside there are numerous places to explore, including sawmill, ice house and thatched summerhouse. Discover a world of inspiring design and unique style with a variety of traditional and contemporary gift ware pieces for your home. 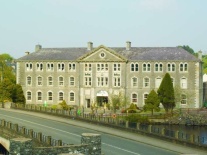 A worldwide reputation for quality and craftsmanship and a history that stretches over 150 years have brought the Belleek brand to homes throughout the world. Practical tableware, distinctive statement pieces, lighting and now successful designer jewellery collection have all been passionately designed to fit in with your lifestyle. Situated in the heart of Strabane, Gray’s looks like any other shop front. 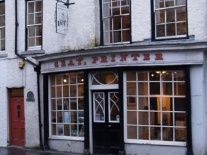 A treasure trove of galleys, ink and presses hidden behind an 18th century shop front. This is where John Dunlap, printer of the American Declaration of Independence, and James Wilson, grandfather of President Woodrow Wilson, are said to have learned their trade. 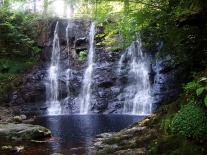 The Glens of Antrim are naturally unique and a designated Area of Outstanding natural beauty. Within twenty square miles you can enjoy natural landscape that covers glacial valleys, sandy beaches, verticle cliffs, tundra plateau, boglands, wooded decidious glens, coniferous forests, waterfalls and pitcturesque villages. The names of the Glens evoke their history and features:- Glenarm (glen of the army), Glencloy (glen of the dykes), Glenariff (glen of the plough), Glenballyemon (Edwardstown Glen), Glanaan (glen of the little fords), Glencorp (glen of the dead), Glendun (brown glen), Glenshesk (glen of the reeds) and Glentaisie (after Taisie, princess of Rathlin Island). 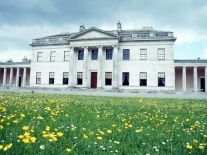 Spring hill House is described as ‘one of the prettiest houses in Ulster’. Experience the beguiling spirit of this inimitable 17th-century ‘Plantation’ home, with its walled gardens and parkland, full of tempting way marked paths. There are ten generations of Lenox-Conyngham family tales to enthral you, as well as numerous portraits and much furniture to admire-not forgetting Ireland’s best documented ghost, Olivia. The Costume Collection, which features some fine 18th- to 20th-century pieces that highlight its great charm and enthralling past. Glenveagh National Park is one of six national parks in Ireland. Situated in the Northwest of Co. Donegal, Glenveagh encompasses some 16,000 acres in the heart of the Derryveagh Mountains. Such a great wilderness is the haunt of many interesting plants and animals. These lands were managed as a private deer forest before becoming a National Park in 1975. 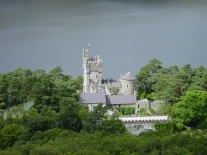 With the completion of public facilities Glenveagh National Park was officially opened to the public in 1986. 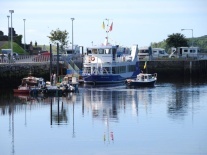 The very popular Waterbus is based at the Pier in Donegal Town and is a ‘must do’ attraction. It is enjoyed by locals and tourists alike and offers a great trip and is loved by children and adults. It is fully equipped to the highest standards and includes a full bar and toilet facilities. Bringing thousands of people down Donegal Bay it has become one of the top attractions in the North West of Ireland. Fort Dunree, Dun Fhraoigh in Irish means, ‘Fort of the Heather’ and indicates that the site has been an important defensive site down through history. Today however, its stunning natural beauty and abundant wildlife are drawing increasing numbers of visitors to one of Inishowen’s most beautiful and peaceful locations. Located in the old Coast Guard Station, only 100 yards from the Lough Foyle Ferry landing at Greencastle Harbour. Attractions include extensive nautical exhibits, memorabilia, photographs, models, modern and ancient maritime equipment and Irish boats from six to fifty feet. The Inishowen Maritime Museum is perfect for Maritime enthusiasts. 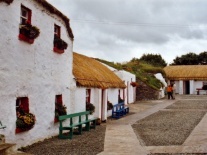 The Famine Village is an outdoor museum that tells the story of life in the area from the Famine back in the 1840s, through the 1900s to the present day. An excellent opportunity to get an insight into the lives and suffering of those living through the Great Irish Famine. A must see for those with Irish ancestry and a great day out for all the family. If you’re interested in Irish history or just want to spend the day as the king of the Castle then Donegal Castle is a must. 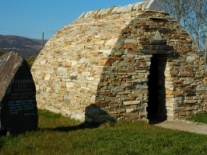 Built by the O’Donnell Chieftains in the 15th century, beside the river Eske in Donegal town. 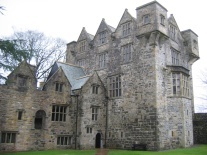 Was Rebuilt in Jacobean style in 16th century by Sir Basil Brooke and has had extensive 17th century additions by Sir Brooke. 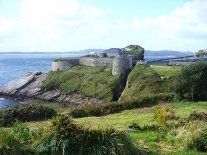 Get a true sense of the life of an Irish Cheiftain with a visit to this amazing piece of Irish history. 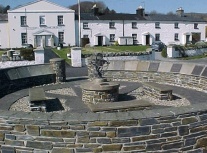 A six-Acre garden laid out in the shape of Ireland which depicts the lives of the major saints of Ireland’s Golden Age. A place of incredible natural beauty and peace away from today’s hectic pace of life.